Welcome to the concluding part of my review of The Garden House. (Please click for Part 1 or Part 2). The Ovals Garden is one of Keith Wiley’s most arresting designs, and is a brilliantly clever way to terrace a small, steep slope without using straight lines. A masterful handling of a common situation, it shows real originality, whilst managing to produce something quite practical. The ‘grassy’ areas (actually two contrasting forms of Ophiopogon, although the dominant green type is gradually overwhelming the purple) aren’t perhaps flat enough to make them truly useful, but the surrounding walls make very fine ‘perching’ seats, with a variety of interesting views. And the level area with summer house at the top would be ample dining/sitting space in a small town garden. This is one of the more formally constructed areas, and therefore one that would work in isolation in any similarly sized, sloping site. You could literally replicate it in it’s entirety, but you would have to get the stonework right — the walls are key, and had they not been so beautifully constructed, the whole garden would have suffered. Just at the foot of The Ovals Garden is one of my highlights of the The Garden House, and another feature that could be lifted out and placed into your own outdoor space. Yet again, it involves beautifully executed stonework that has been allowed to ‘fur-up’ with a mass of lime-green moss and fern, giving it an almost ‘cuddly’ look. 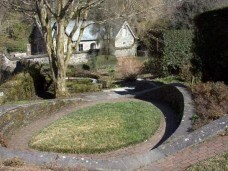 A low stone wall — with built-in, timber-topped bench — curves around in a circle, and then rises at the back to create a lovely seating area beneath a similarly moss-covered tree. Partway down the slope towards The Walled Garden — and perched atop a stone retaining wall — this provides a good vantage point over much of the garden, with an almost tree-house-like feel. If I was to choose one part of the garden as my own, I think it might be The Walled Garden. Arguably it is largely dependant for it’s character on the surrounding bounty of enviable architecture and ancient stone walls (the phrase ‘an embarrassment of riches’ springs to mind): but nevertheless, it’s a great space. With the bare bones exposed, and the soft tawny browns and greens of the stripped-back planting complimenting the ancient buildings, it has a calm feeling about it; and a reassuring sense that both history and nature are ever-present constants in life. Of particular note plant-wise were the beautifully slim hedges: Phillyrea angustifolia v. rosmarinifolia, that snake through this area. Buxus would have perhaps been a more obvious choice, but here, in this sheltered part of the garden, the less usual ‘evergreen privet’ — actually a member of the olive family — adds a very distinctive and elegant air, with it’s greyish-green (yet light-reflecting), narrow leaves. 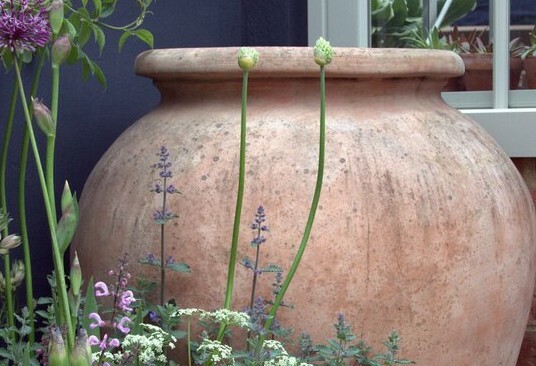 Artfully cut into slim wedges, with almost pointed tops, they delicately divide the garden, fulfilling a vital structural role without heaviness or predictability. 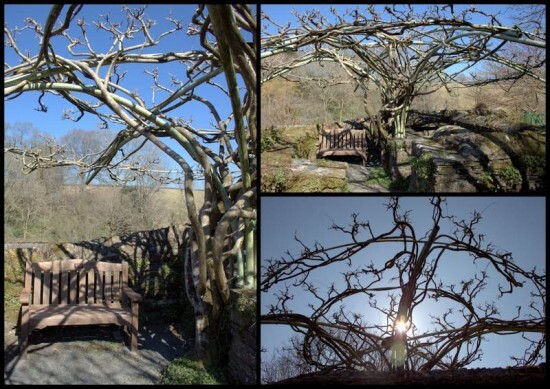 The mushroom-shaped wisteria arbour on The Annexe Terrace was probably my favourite feature. Again, it’s another winter winner, that works just as beautifully when the Wisteria (‘Burford‘) is dormant, as at this time of year you can really appreciate the underlying structure — besides, gnarled stems of wisteria are always one of the delights of the colder months. Catching the late evening sun, it’s perfect for a secluded evening drink, and is a great vantage point overlooking much of the walled garden area. Most exciting of all though, is the approach from below — particularly with the lack of wisteria leaves: The umbrella-like structure, wrapped with twisting stems and vaguely resembling a gigantic sea creature, looms above the tall stone wall in dramatic fashion. There’s an uncertainty about quite what you will find when you climb the small stone steps and turn the corner, and you aren’t disappointed. Another clever design trick; to tantalise from below by allowing the structure to overhang the tall stone wall, and use the difference in levels to heighten the drama. The Arboretum was created in 2011 to celebrate the Golden Jubilee of the Garden House trust. 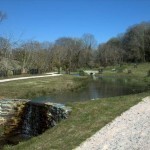 The 2 acre site, originally used as a nursery, now boasts a large pond, with (of course) good stone bridges and cascades, and a summerhouse is planned for the future. 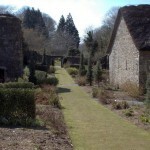 A newly re-built stone wall with large archway separates it from the main garden, and a natural hedge divides it from the field beyond, giving this area a distinctly relaxed feel. 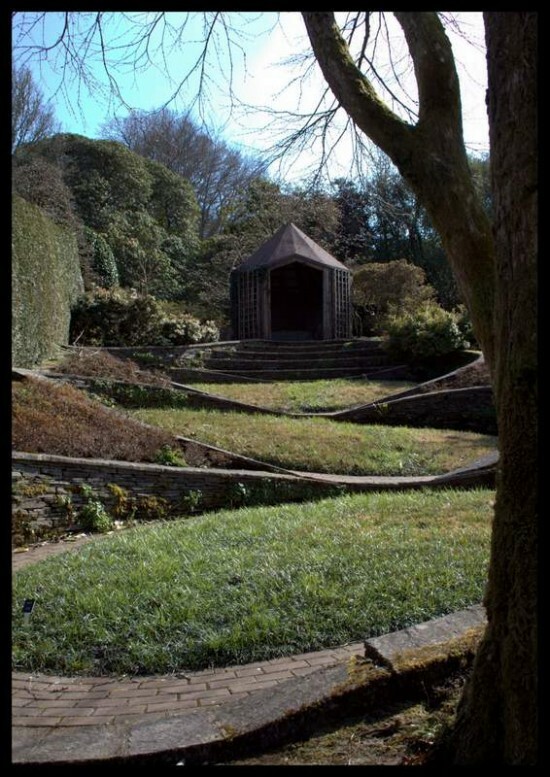 Located in a mini valley, it is far more sheltered than the north-facing slopes which make up the bulk of The Garden House, and it was something of a sun trap the day I was there. Easily accessible by wheelchairs, it will be a wonderful spot for the less physically able to get close to nature, and I imagine it will be popular with children too. I hope they allow picnics here, although I suppose that would compete with the very tasty offerings from the tea room in the main house. A waiter service delivering drinks and sandwiches would be perfect, but that’s probably just wishful thinking! 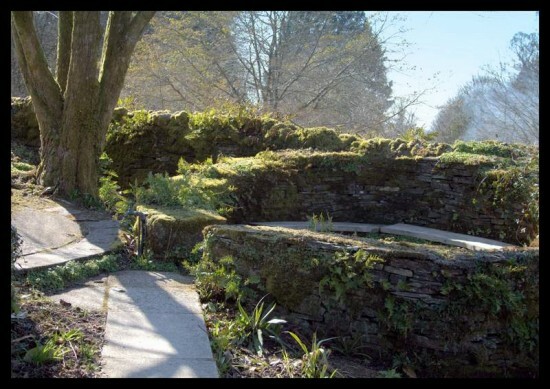 I visited The Garden House, Buckland Monachorum, Yelverton, Devon PL20 7LQ during the first week of April 2013, when the spring was very delayed due to prolonged cold weather. I intend to revisit throughout the year and see how the areas develop: Do check back for a summer report.